We are the Young Americans! 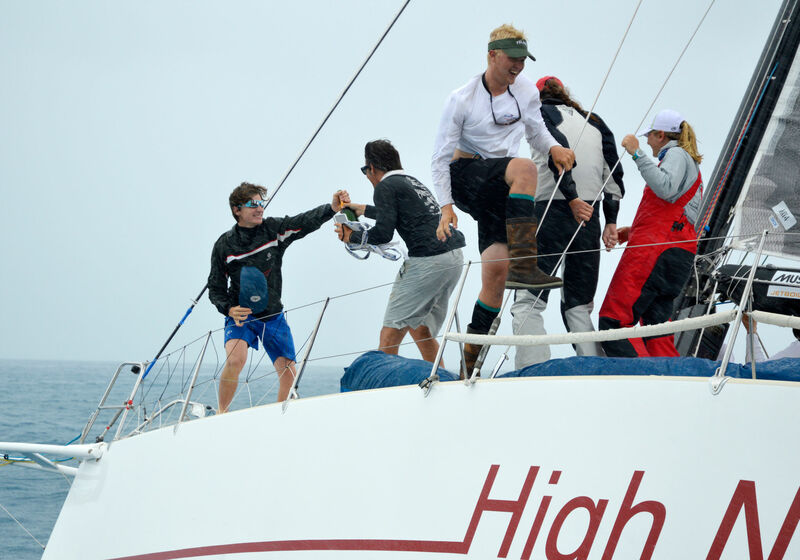 In 2016, seven members of the Young American Junior Big Boat Sailing Team made yachting history by sailing the Tripp 41 High Noon to victory in the 50th Newport Bermuda Race, winning line honors and finishing first in class, third overall in the St. David’s Lighthouse Division, and first in the Onion Patch Series. These young sailors (ages 15 to 18) also became the first recipients of the event’s Stephens Brothers Youth Division Trophy. The Young American Sailing Academy (YASA) is offering junior sailors of Western Long Island Sound two levels of enhanced opportunities for big boat sailing. The YASA offering is designed to complement existing programs at yacht clubs and sailing organizations. This is the where juniors are given the “keys” and their independence, supported by focused adult coaching. This level is primarily focused on high school-aged sailors looking to build the basics of big boat sailing. These sailors gain sea miles and practice skills while competing in inshore day races and short distance races such as Edlu and Stratford Shoal races from early May to late September. The program is divided into three seasons; spring, summer and fall. You may join the team for any or all seasons. YASA’s two J/105s are the primary boats Level 100 sailors will sail, one homeported in Rye, New York and the other in Stamford, Connecticut. This level is designed primarily for experienced young sailors who have the desire to expand their offshore sailing skills by sailing longer distance races. Level 200 is campaign-based in that YASA builds a team around a boat and a specific race or a series of races. Campaigns such as the Newport Bermuda Race will require a high level of time commitment and intensity. Each Level 200 campaign will be made up of YASA sailing team members on an application selection basis. First – Go to “Register” and remit payment for the spring season or for the whole year. Second – Send an email to Info@yasailing.org with L-100 in the subject line letting us know you are participating and we will send you the L-100 questionnaire/survey to fill out. Send an email to Info@yasailing.org with L-200 in the subject line and we will send you the L-200 application/questionnaire to fill out. If you are a junior sailor, we encourage you to sign up and start having some fun. YASA is a fully volunteer effort, so if you are an adult and like big boats we invite you to join the team and have fun helping out.